The Women’s Fund of Santa Barbara awarded grants to seven local nonprofits represented by, front row from left, Fran Forman of the Community Action Commission, Kristine Schwarz of New Beginnings Counseling Center and Kathleen Baushke of Transition House; back row from left, Debbie McQuade of Sarah House, Michelle Graham of the Children’s Resource & Referral, Lizzie Rodriguez of Conflict Solutions Center and Annmarie Cameron of the Mental Wellness Center. Courtesy Women’s Fund of SB. Seven local nonprofits received a total of $460,000 in grants from the Women’s Fund of Santa Barbara on Monday afternoon at the Montecito Country Club, bringing the organization’s total contributions to the community, since it began in 2004, to more than $5.1 million. Local nonprofit organizations receiving awards were Children’s Resource & Referral, the Community Action Commission, the Conflict Solutions Center, the Mental Wellness Center, New Beginnings Counseling Center, Sarah House and Transition House. Accepting the first grant of the day was Michelle Graham, executive director of Children’s Resource & Referral. The agency received $80,000 to increase the number of child-care spaces in new, women-owned family child-care businesses. Fran Forman, executive director of the Community Action Commission, accepted a donation of $80,000 for the Healthy Seniors Lunch program, which will serve more than 600 low-income and disabled seniors in the coming year. Lizzie Rodriguez, executive director of the Conflict Solutions Center, accepted a grant of $60,000 to launch a restorative justice program as an alternative to juvenile incarceration. Accepting a $60,000 grant to fund the establishment of peer-to-peer support groups for families dealing with early onset teen mental illness was Annmarie Cameron, CEO of the Mental Wellness Center. New Beginnings Counseling Center received $80,000 to assist individuals and families living in their vehicles. Executive Director Debbie McQuade accepted a $50,000 grant for Sarah House to deliver hospice care to low-income individuals suffering terminal illnesses. The grant funds the equivalent of one caregiver position for one year in the residential care facility. The final grant of the day went to Transition House, for $50,000 to install air conditioning and sound proofing in the family homeless shelter. “We know we ask a lot of the families in our program,” Executive Director Kathleen Baushke said. “Over the three or four months they are with us, parents are expected to find jobs, take anti-poverty classes, and work with their case managers on creating — and sticking to — monthly budgets and savings plans. Children are encouraged to keep up with their schoolwork and do their best to behave in an unfamiliar environment. By the end of their stay, successful residents have solid employment, money saved for a security deposit, and life skills that will allow them maintain their housing long-term. We work with the children in hopes that they experience minimal negative impacts due to experiencing homelessness. Laurie Tumbler and Christine Riesenfeld were the research committee co-chairs for 2014-15, and Stina Hans chaired the event. 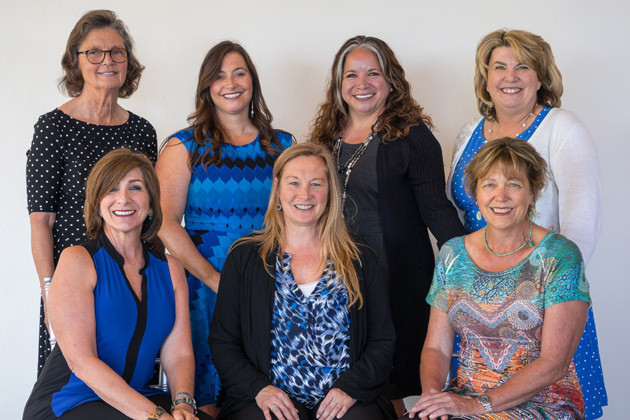 Click here for more information about the Women’s Fund of Santa Barbara. Originally published on Noozhawk on May 6, 2015. This entry was posted in Articles, Human Interest News, News, Nonprofits and tagged CAC, Children’s Resource & Referral, Conflict Solutions Center, Leslie Dinaberg, Mental Wellness Center, New Beginnings Counseling, Noozhawk, Santa Barbara Nonprofits, Sarah House, Transition House, Women's Fund of Santa Barbara' by lesliedinaberg. Bookmark the permalink.